Over 12 million Filipinos live in extreme poverty, and many sell drugs to make a living. This caused crime rates to be at an all-time high. President Rodrigo Duterte was elected in 2016 because he promised to crack down on crime. He was called “The Punisher” because of the way he spoke out against drug addicts and drug dealers, suggesting that they should be killed. But after his inauguration, there was a wave of murders that he now denies having any participation in. He says that he had barely taken up his new position when the killings started but admits to having fired seven police generals because of their involvement in drugs. Brutal street executions by paid vigilantes have increased to the point that people have lost faith in law enforcement. Bodies are found lying on the side of the road with their heads wrapped in tape, stab wounds to the neck, and threatening ‘explanatory’ messages directed at anyone who reads them. There are reports that state that more than four thousand innocent persons have died due to ‘unexplained circumstances’. Duterte calls them ‘collateral damage’ and says that even if it’s true, what’s a few thousand compared to the lives of millions of Filipinos that can be destroyed by drugs? There’s a wake almost every night as some poverty-stricken family is left to mourn for a loved one that has been murdered. Sometimes the family doesn’t even have enough money for a funeral much less an investigation. They don’t trust the authorities to look out for them. Many believe that it’s either the police or people working for them that are carrying out the executions. What’s appalling is that many of the men that are murdered had absolutely nothing to do with drugs. One prison that is supposed to house only 800 inmates has over three thousand men packed in it. Most of them are there for drug charges. Many fear for their lives outside the prison and say that they would rather stay under those cruel conditions than leave because they know that on the outside they would be murdered. There are cases of inmates who were killed within a week of their release. The numbers of men in the prison increased drastically after President Duterte came into power. 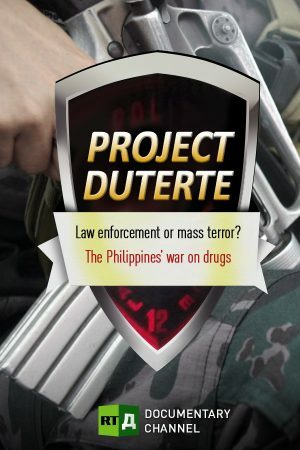 Project Duterte is Drug Use and Trafficking Elimination thru Rehabilitation, Training, and Enforcement. Watch this film now.